Nostradamus is one of the world's most famous authors of prophecies. He is best known for his book Les Propheties, which consists of one unrhymed and 941 rhymed quatrains, grouped into nine sets of 100 and one of 42, called"Centuries". Nostradamus (Michel de Nostredame) - a Jewish prophet, astrologer, astronomer and physician - was born in St. Remy, France, and converted to Catholicism to avoid religious persecution. His intrinsic wisdom and future visions were true in many cases (although many of his one thousand or so quatrains are vague.) In Centuries he foresaw events far removed from his times — flying machines, the fall of communism, the world wars, alien visitors, and others. Nostradamus was a French seer living in the 16th century. His predictions of the future are some of the most famous in history, and continue to enjoy widespread popularity to the current day. With the exception of Biblical prophets, his visions are by far the most well-known of the many seers who have existed over the past few centuries. Nostradamus was born Michel de Nostredame at the dawn of the 16th century, to a notary and grain dealer. In his early adult years, Nostradamus practiced as an apothecary. He attended medical school for a period, but was expelled when his past as an apothecary was discovered. The next few years of his life were spent battling the plague in France and Italy. In his late forties, Michel de Nostredame changed his name to the Latin Nostradamus, and began publishing occult tracts. He began writing yearly almanacs, which contained among them thousands of prophecies. These almanacs began to do quite well commercially, and their success prompted many distinguished people to request individual astrological consultations from Nostradamus. Nostradamus was notably not much of an astrologer, however, and charts he prepared are consistently riddled with simple factual errors. Generally he requested his clients supply their own astrological charts for him to interpret. The success of his almanacs and private consultations led Nostradamus to undertake a more ambitious project, in the form of a massive book of prophetic quatrains, the remains of which are the work for which he is most well known. The accuracy and uncanny detail of Nostradamus' prediction in 1556 foreseeing the death of Henry II by 1559 propelled him to new heights and royal recognition. His immense visionary power made him vulnerable to religious persecution and was hounded by the Inquisition for a decade prior to his death. It is for this reason his prophecies are obscure and safeguarded in ancient languages and cryptic camouflage, with strange references and metaphors to contemporary as well as future events. Given the latent paranoia of the evil of women during his time, any prophecy to their rise had to be well hidden from inquisitive minds. Even if he had been forced to explain them there were always"safe"interpretations. At the time, neither astrology nor prophecy were considered heretical practices, and Nostradamus actually had a relatively positive relationship to the Church. Nonetheless, he was always wary of inciting the wrath of the Inquisition, particularly once his prophecies started attracting attention. Although he was clear that he used no magic to make his prophecies, people nevertheless began to accuse him of being in league with the Devil to tell the future. As a way of dealing with this, Nostradamus obfuscated his prophecies somewhat. The majority of the prophecy found in his major collection are in the form of quatrains, often using word play and various Classical languages to hide their meanings. This additionally allows a number of interpretations to be placed on each quatrain, helping to ensure that those who wish to find truth in them can match them to actual events as they occur. Nostradamus drew heavily on Biblical allusions and prophecies to make his own predictions of the future. As well as adding a certain amount of weight to his writing, this also helped bolster his claims that his insights were spiritually guided, rather than being the work of the Devil. Many of Nostradamus’ prophecies reference events that occur in the Old and New Testaments, and draw upon characters from the Bible as well. Throughout his work, Nostradamus rejected the label of "prophet," holding that in reserve for the Biblical prophets who he viewed as truly inspired by a direct connection with God. His work he instead presented as rationalist, looking at planetary alignments in history, and correlating future events with events that happened in the past. Unlike many other historical prophets, many of whom the Church considered heretical, Nostradamus never claimed to use any special forms of trance or mysticism to do his work, but rather presented it as an exercise of the mind, similar in form and function to the other natural sciences of the age. 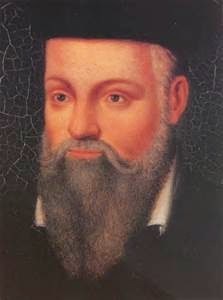 Nostradamus died of gout in 1566, at 62, after supposedly predicting his own death to his secretary the night before. His works continued to be fairly popular for a time after his death, with the majority of the prophecies published together in 1568. Although most of his other works, such as the Almanacs which led to his fame in his lifetime, or the Orus Apollo, soon fell into obscurity, the Prophecies themselves saw a massive resurgence in the wake of the 19th century occult revival. The Prophecies by Nostradamus continue to be applied to major world events, and will likely continue to be applied to events well into the future. The rise of Hitler and the start of World War 2. The September 11 terrorist acts. The attempted assassination of Pope John Paul II. The Great Fire of London. The death of Diana, Princess of Wales. The Space Shuttle Challenger disaster. The use of nuclear weapons in war. But the problem is that much of what people claim he predicted is not accurate, and a closer look at his actual writings shows that the internet sources that credit him are often being far too generous.